I hope you all are having a fabulous Christmas vacation right now! I've been so busy shopping, wrapping, baking, and visiting friends & family that I hadn't had a chance to post my Christmas Eve outfit yet! Sometimes we really do need a few days to unplug from our devices; it was definitely a much-needed mini break. Christmas Eve, we got together with the extended family for a full turkey dinner, wine and craft beer gift exchange (woohoo! ), and lots of catching up. I thrifted this unique skirt a few months back, and knew immediately it would make an interesting holiday outfit. I've been overly obsessed with plaid this season, so naturally this full-length piece caught my eye among the racks of skirts in the thrift store. This is one of those pieces I felt was a bit of a 'fashion risk' when I first tried it on, but I'm very glad I brought it home with me! Of course, no holiday look would be complete without out some sparkle, both in the form of sequins and some statement jewelry. I am head over heels right now with the trendy new double-pearl earrings that have taken the fashion world by storm lately; they are such a perfect way to add a touch of edginess to the usually simple and classic pearl earrings. If you haven't heard of jewelry brand Nobis & Grey yet, I highly recommend checking them out. They sell both these edgy pearl earrings and my eye-catching statement necklace, and if you're a thrifty fashionista like me, you'll love how gorgeous and affordable their pieces are too! 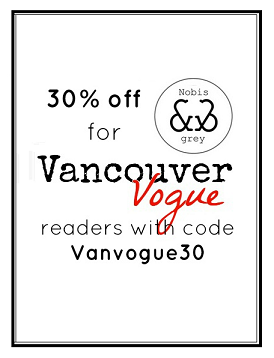 As a special surprise for you, Nobis and Grey is offering 30% their entire online store when you use the code VANVOGUE30!